Just like we need to declutter our environments, hearts, and minds, we also need to declutter Spirit. 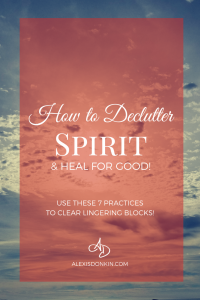 In this post I explain spiritual clutter, why it’s important to clear it, and how you can get started today! If you really want to move on in your life, you need to let go of things that are holding you back. This is what the decluttering process is – letting go of things that were (the past) as well as things that may never be (uncertain futures). You may think you’ve let go of many things, and you may have. From the surface, many people appear to be quite together. But that’s the surface. If you haven’t done a deep clean, you may continue to struggle. This is when it’s time to declutter Spirit. When I use the word Spirit, I mean that which cannot be seen by the naked eye. You could use the word energy, aura, or soul. This is anything that cannot be seen by the average person with their own two eyes. Most people do not see this part of experience, but they do feel its effects, which is why decluttering Spirit is so important. I’ve written at length about decluttering the physical, as well as ways to declutter the heart and mind. To practice stillness, a good beginning is meditation (which I’ve written about here). These are fairly clear cut and make sense to most people. It’s the fourth step that feels, well, weird. Since uncovering my intuitive abilities (read about that here), I’ve learned a LOT about how people move through life. Most people only see the physical manifestation of their issues. These can be things as small as a zit on the face or as big as bankruptcy. Few people see or understand the spiritual influences that help create these situations. My privilege is seeing these things in the spiritual in addition to the physical. People carry their pains, beliefs, and past experiences in spirit. I’ve seen everything – from shrapnel that needed to be cut out of a heart center (and it was extremely graphic to go through that process), to a cold wall enclosing an entire energy body from the world (this would need serious consistent reintegration work), to a small bit of black dust causing inflamation in a joint. I’ve seen hard stones blocking energy centers, but I’ve also seen washed-out or darkened auras. And this is just the energy around individuals – this doesn’t even touch the spiritual landscape of places. Think of a time when you walked into a building and it felt, well, creepy. Maybe a place felt, well, sick. 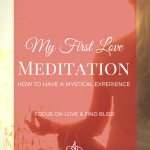 If you experienced these things, imagine what it feels like as a strong intuitive – not. good. So yes, all of these are as bad as they sound. As you move through life, you need regular maintenance to keep every area of your life neat and clean. A physical example is periodically going through your closet, purging things that no longer serve (and doing this on a regular basis keeps your space healthy). A heart and mind example is practicing regular forgiveness and acceptance. You keep your relationships in good order by spending time with friends. You keep your mind in good order by educating yourself and evaluating your thought patterns. There is a reason people do spring cleaning every year. Think about what would happen if you didn’t deep clean your house regularly. It’s not pretty. The spirit is the same. I share this because if you don’t remove the root cause in the spiritual, you are much more likely to experience a recurrence of whatever is going on in your life. This can involve your physical space, or it can involve your personal spirit. It prevents recurrence of an issue by fostering healing on a deep level. It brings a sense of closure. It allows you to be fully present and therefore experience more joy, peace, love, and total wellness. Decluttering Spirit can be complicated, or very simple. It really depends on how long you’ve gone since clearing out your spiritual clutter and what you have in your past. Everyone has something in their energy field or attached to their spirit at some point. Health is often rooted in Spirit, and all of us have been sick or injured at some point or another (Note: This is not to say that all illness can be cured by spiritual decluttering – continue seeing your medical care provider! That said, spiritual decluttering can support and compliment healing.). Reiki – a great option to bring energetic healing. Every practitioner has their own feel, so feel free to shop around until you find someone who resonates with you. Forgiveness – I know I said this was a heart practice, and it is… but… This can lay the foundation for loosening up any spiritual gunk you have around you and is best done in combination with other options on this list. Guided clearing exercises – these are specifically designed to “wash” your spirit. You will likely feel lighter and more refreshed after doing one of these exercises. There are a ton available on YouTube, so play around and find one that feels good to you! 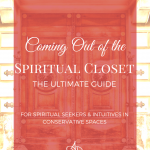 Space clearing – this is spiritually decluttering a physical space like a room. It can be done with water, salt, essential oils, or smoke (whatever you use, make sure it’s energetically clean, otherwise, what is the point?). Space clearing can be complicated and intense (involving a spiritual practitioner coming to assist you) or it can be simple with you doing a quick physical clean of your space, and then walking around to spread the element around. While I think you can do this without too much guidance, it definitely helps if you move in a clockwise motion around the room, starting and ending at the entrance. If in doubt, bring in a master. Spending time outside – being outdoors makes a big difference for your spiritual wellness. Make sure you are still or in an isolated area for this to have the strongest impact. I find this works best when in the forest or by water, but you may feel energized by the desert or rock formations. This is especially important for those with a high EQ. Make this a habit for regular spiritual maintenance. Intuitives & Shamans – these are “the big guns.” If you have something you just can’t shake, you need outside help. 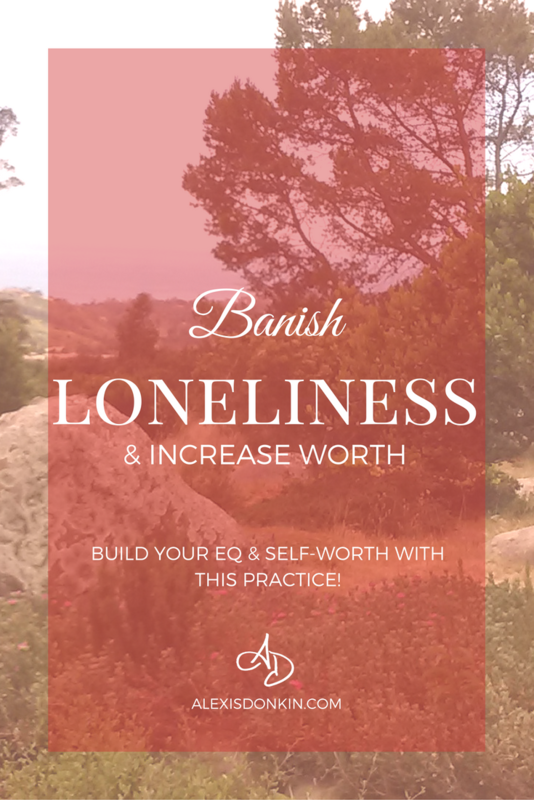 This is where you go to get “spiritual surgery” and can involve the practitioner spiritually carving out the problem area and or transmuting it, or reintegrating your spirit. There are other kinds of treatments that may assist you, but it depends on what will work best for your situation. 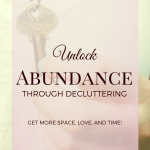 While decluttering your physical environment, as well as your heart and mind, are important to do, they may not be enough to remove old patterns. 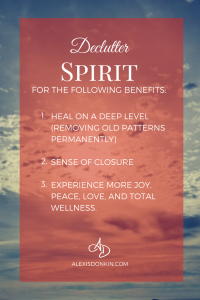 Sometimes to bring about long-lasting healing, you need to declutter Spirit too. You can do that a number of ways that range from very simple to very involved. Any single one or a combination may be helpful to you. Try a few different things to find what works best for you! Alexis Donkin is a life coach & intuitive helping creatives build lives based in unconditional love. She is the creator of The Compassion Letter weekly newsletter, and the online course, The Heart Unboxed: How to Love the Unloveable, as well as author of over 17 books. What a timely post for me, Alexis. I’ve been feeling that–clutter stuffing my spirit. As I move forward in all areas, sometimes I just feel that pull from the past that weighs me down. Time for a guided clearing exercise. Thank you! I’m so glad this spoke to you! I’ve been going through this myself on many levels! I think as a society we get caught up in the physical and forget we are more than just bodies! Clutter happens on many levels and without clearing out all those levels, we often find ourselves repeating things we thought we’d resolved! I’m finding a lot of clarity with meditation, space clearing, and soul retrieval myself! It’s amazing how much stuff we carry around with us! Such an insightful and helpful post, thank you so much Alexis. I think we are so lucky to live in a time when so many resources are available to really help us clear on the deepest levels. I’ve used many of the ones you’ve spoken of and know how much they’ve helped me to align and to get to the place where I am now.